The Bermuda Government is currently accepting applications for the 2019 Public Service Bursary Award Scheme. 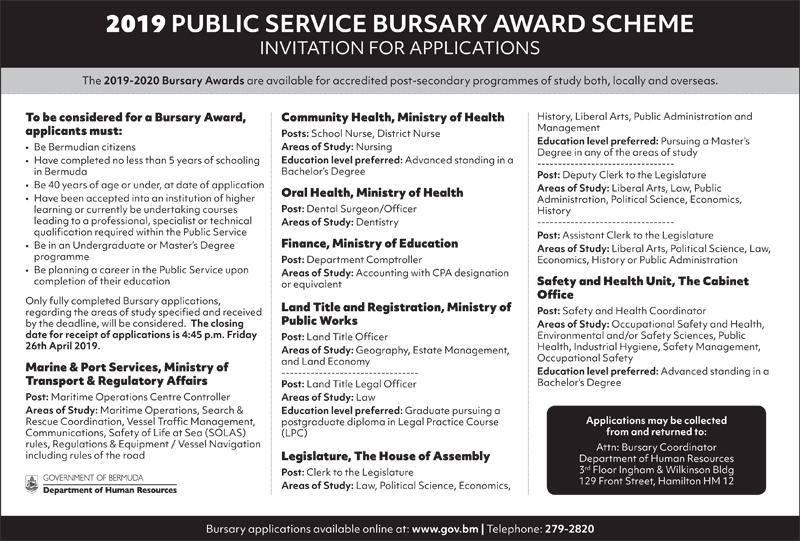 “The Public Service Bursary Award Scheme provides funding to Bermudians pursuing post-secondary academic qualifications in a discipline identified to meet future needs of Government Departments. This ensures a well-trained cadre of people to fill positions within the Public Service. The bursaries are valued at $10,000 per annum; not exceeding five years,” a spokesperson said. “Applications for the Bursaries can be downloaded here. The closing date for receipt of applications is April 26, 2019. “The Bursaries are awarded by the Public Service Commission [PSC] to selected applicants enrolled in courses of study at a university, college or other training institution, in order to acquire professional or technical qualifications. Be Bermudian citizens;Have completed no less than 5 years of schooling in Bermuda;Be 40 years of age or under, at date of application;Have been accepted into an institution of higher learning or currently be undertaking courses leading to a professional, specialist or technical qualification required within the Public Service;Be in an Undergraduate or Master’s Degree programme; andBe planning a career in the Public Service upon completion of their education. “Only fully completed Bursary applications, regarding the areas of study specified and received by the deadline, will be considered. Forms should be sent to: The Bursary Coordinator, Department of Human Resources, 3rd Floor, Ingham and Wilkinson Building, 129 Front Street, Hamilton HM 12, to arrive no later than 4:45 p.m. 26 April 2019.